I kind of overuse the phrase “one-card combo”, but I think it applies to Muldrotha. While graveyard removal is a staple of Commander and other casual settings (or it probably should be), you can never be sure that your opponent is following staple construction practices and the advantage you get from a second use of cards is hard for most opponents to keep up with. I tend to agree with the idea that it’s often better to get (“draw”) cards from your graveyard than to do so blindly from the library, because you already know exactly what’s in there and because it’s often easier to stock your graveyard than it is to know what’s on top of your library. Muldrotha, the Gravetide is the gift that keeps giving, and giving, and giving. The best part of this card’s ability is that the cards you play don’t have an exile clause. Go ahead and cast Sidisi, Undead Vizier every turn. Although to maximize its abilities you are going to need a lot of mana. Fortunately Muldrotha works as a Crucible of Worlds. 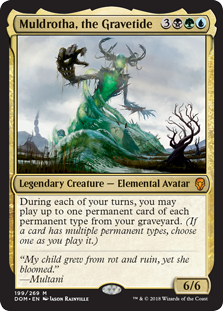 I feel like Muldrothe is the Sultai commander. As all Golgari players know, your graveyard is a powerful tool. So load up on Delirium and Delve cards. A 6/6 is nothing to scoff at either. If your opponent is at either board or hand disadvantage then they will quick get swept away by the Gravetide. Recursive effects are always dangerous to have on hand, and Muldrotha is dangerous indeed. In theory, you can play up to six different cards each turn (five in the current Standard, as Tribal is largely obsolete at this point), as long as you play each card type only once. You can still play two artifact creatures (one as your “artifact”, one as your “creature”), and there are a lot of ways to make Muldrotha a massive swing. It’s also in Sultai, the color combination that likes to load up its yard. I’m not sure if Muldrotha can cut it in Constructed, as it folds easily to removal and needs time to do its thing, but it’s a star in Limited and more casual formats, as that effect is too good to pass up.